I’m seriously so sad right now after the release of IPCC report on climate change. Based on the report, even a slight increase in global warming can be disastrous for the entire humankind. But there’s a way to stop it. And that’s by planting trees, cutting down on waste, and by making conscious choices in terms of EVERYTHING, like even what you eat! Recently making the choice to become Vegan (after being vegetarian for many years), not only do I feel that I’m helping minimize cruelty but being vegan is also very good for the planet! Think about all those resources the animals you eat are using up? Especially the Beef and Pork! It’s not just trees and animals either, but when it comes to clothes, bags, and shoes we can be majorly more conscious of our effect on the planet by shopping better – because these are some of the major land pollutants. In fact, fashion is now Earth’s #2 Pollutant! Pretty shocking right?! I recently watched a documentary on fast fashion and just how disastrous it is for our planet, not to mention how hard it is making it for eco-friendly fashion entrepreneurs to make a living! There is so much cheap clothing on this planet, that although you feel some good donating it, about 90% of it is being shipped to 3rd world countries who are becoming overwhelmed with all the fashion! It’s too much! We need to invest in things that are durable and long-lasting so less stuff ends in landfills. I’ve recently made the pledge to quit buying cheap clothing and only invest in good, quality clothing and accessories that will last me for years to come! Will you join me? And I feel strongly that we need to support the brands that are making positive contributions towards the environment by producing high-quality stuff, following zero waste policy and supporting eco-organizations! Sassy Eco Totes is one such brand. 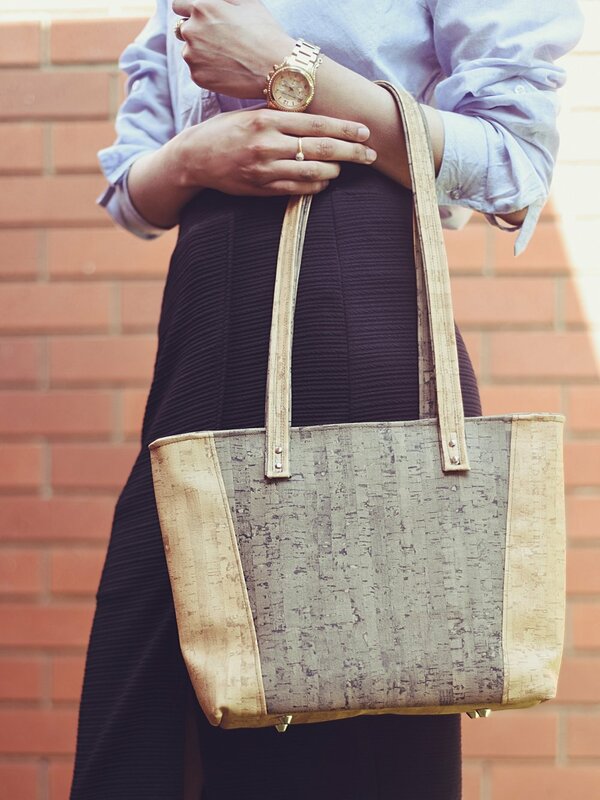 They create handbags from cork fabric which is obtained from cork tree without cutting them down! Awesome, right?! For being a melt, this sandwich is actually really healthy – thanks to not needing a sauce. 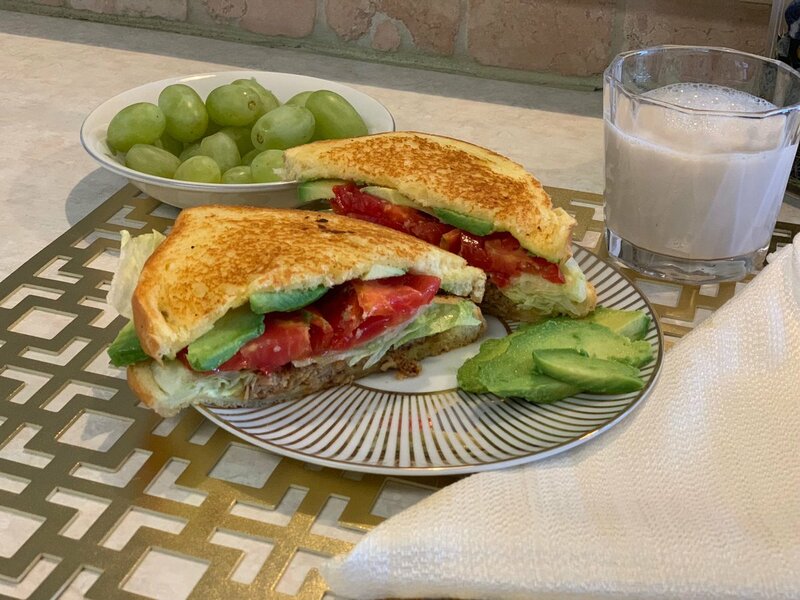 You’ll find the avocado, tomato and vegan cheese paired together completely eliminate the need for any kind of sauce. But feel free to spread on some hummus if you want a melt with a bit more of a smooth, saucy taste, while still keeping the sandwich healthy! This delicious sandwich was created by my boy toy Troy @Olstone! Cook veggie patty in frying pan (or on grill) on med. heat in a little bit of Olive Oil. I like to add garlic and onion powder to the veggie patty while it looks. Cook until lightly browned. Spread 2 slices of sourdough bread with vegan butter on one side each and cook on the buttery side until lightly browned. Add the veggie pattie to bread to form a sandwich. Top the veggie patty with some lettuce, avocado slices, and tomato slices. Top with Vegan Cheese. Cut the sandwich in half and serve! Did you try out this recipe? Let me know your thoughts in the comments below! Be sure to Follow MyStyleSpot on Instagram and Twitter for more yummy vegetarian/vegan recipes! Hey, lovely! With the weather cooling, I’ve been craving those yummy, warm comfort foods. 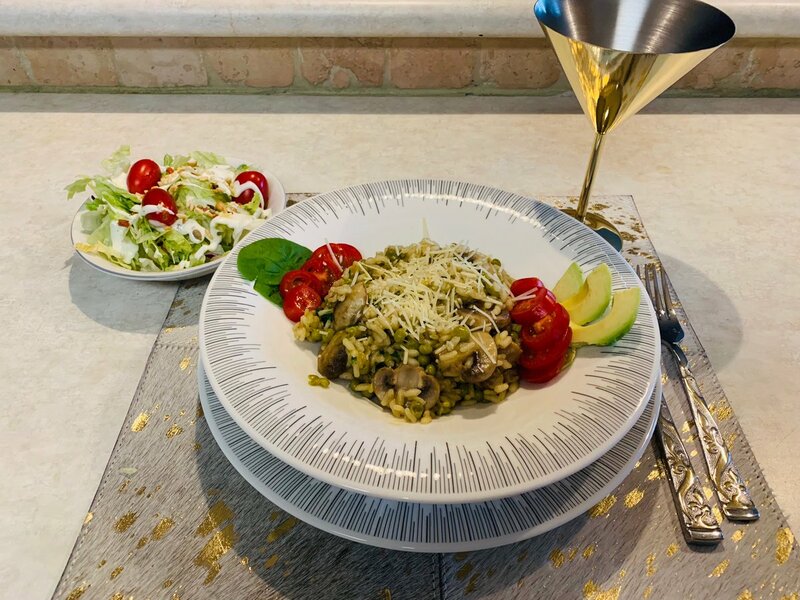 I love a good risotto and a few years back when I met my boyfriend, he made the most amazing Mushroom Risotto, so I had him whip up a new version of one. This one is a little different than I’ve seen, it has peas and yummy spinach – which is always a great pairing with mushroom. Read on for the yummy recipe and one small tip if you tend to get distracted while cooking as I do, and that is… don’t walk away from the Risotto, you do have to constantly stir it while slowing adding broth in order to get that perfect yummy risotto texture!